In theory, Valentine's Day is a time of year to pull out all the stops and use money to prove to someone that you love them. On the other hand, that's an insane way to prove your love. Instead, do something thoughtful (and probably do it regularly instead of just once a year in the dead of winter). However, if you're looking for something that says, 'I know what you love' a heart-shaped pizza might get to the ...ahem... heart of the matter rather quickly. It's a strange, growing Valentine's tradition for pizzerias and major chains -- from Pizza Hut to Jet's, among others -- to fashion their pies into the shape of a heart in honor of the day. So, whether you're all alone, with friends, or are spending time with a significant other, you're probably eating pizza anyhow and if you're inclined to get it in a fun shape, it's a good day to be you. Here's our running list of all the places offering heart-shaped pizzas for Valentine's Day. Note: It's probably a good idea to call your local pizzeria to see if they'd be willing to make you a heart-shaped pizza, too. Some are offering heart-shaped pies without advertising it. They're bringing back heart-shaped pizza, which you can order on its own or as a part of the Valentine's Day Bundle, which includes a one-topping heart-shaped pizza and either a Hershey's Triple Chocolate Brownie or Ultimate Hershey's Chocolate Chip Cookie. Grab a one-topping, heart-shaped pizza on thin crust for $11. Or you can get that plus some brownies for $16. The HeartBaker is back from the take-n-bake chain. Get it through February 14 with pizzas starting at just $9. There's also a promotion called "A Sweetheart of a Deal" that features the pizza and a tub of chocolate chip cookie dough. That's pegged at $12, though the price may vary by location. For the first time, CPK is going to offer a heart-shaped pie. You can get it on crispy thin crust for no additional charge from February 13-17. The Midwest chain is offering heart-shaped pizzas on Valentine's Day only. You can get it in medium thin crust only. Plus, there are $1 brownies available on Valentine's Day, too. If you don’t want to leave the house, Giordano’s is offering a frozen heart-shaped deep dish pizza you can have sent right to your house. You can get it from February 12-17. Grab a six-slice, heart-shaped pizza on Valentine's Day at participating locations. You can even throw in some heart-shaped Jet's bread or cinnamon stix. The pizzas can either have one topping or be ordered as one of the chain's specialty pizzas. You can create your own or pick out a Signature Pizza in everyone's favorite Valentine's Day shape. You can get one for pick-up or delivery from February 14-17. Get a gourmet pie in the shape of your amor. Also, the chain will donate 50 cents to No Kid Hungry for every pizza purchased. Get a heart-shaped pizza with one-topping for just $6.99 if you use the code "HEART1." 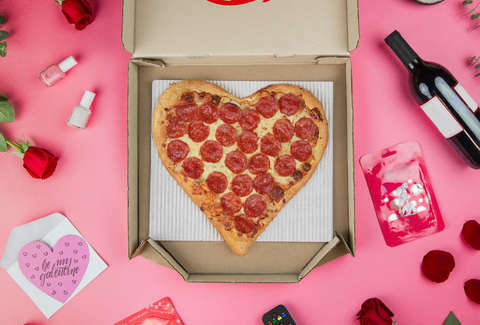 Or you can get a combo deal with heart-shaped pizza and heart-shaped Howie cheese bread for $12.99 with the code "HEART2." All 56 locations will be serving up heart-shaped pizzas through Sunday. Select locations are offering pizzas in a heart shape, piled up with "crispy, curly pepperonis." Find more cheap eats that aren't necessarily in the shape of a heart at the Thrillist list of Valentine's Day food deals. 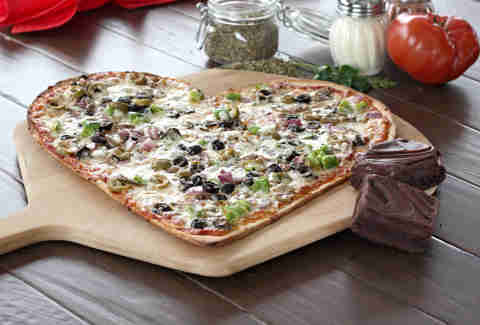 Stop by on Valentine's Day to get grab a heart-shaped pizza and two glasses of sparkling wine for $20. Swing by the Whittier pizza shop to get a heart-shaped pizza, bottle of wine, and a rose for $29.95. Mama's is serving up medium-sized heart-shaped pizzas all day long. Price varies by what you're throwing on top of the heart. The pizzeria at Industry City is serving up coal-oven pizza in the shape of a heart. During the Heart Show live art show from 7-10pm, you can grab a $10 heart-shaped pizza, as well as $2 tacos and $4 Modelos. The shop has medium heart-shaped pizzas available. You can also get a medium and a two-liter bottle of soda for $17.99. All four locations are offering up large, heart-shaped pizzas. That's the only size available, but probably the only size you'd want anyway. 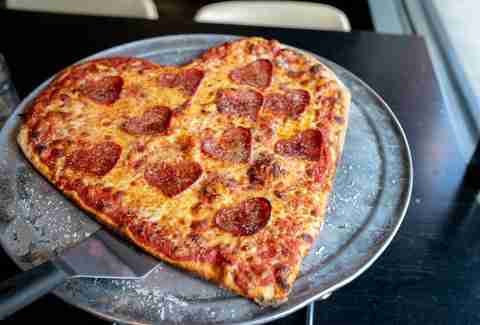 If you know of any heart-shaped pizza deals we missed, shoot us an email to news@thrillist.com and we'll add 'em here.